Choose from our huge assortment of select FAll, Winter & Basics Clearance Apparel priced at $1.00 each. This offer is not valid with any other discounts. This deal was my husband’s idea. We are dark-chocolate lovers, and he recently suggested heading to For the Love of Chocolate in Carytown to get our fix… then added, “Maybe we should wait until after Valentine’s Day.” Smart man. 1 canister of Dove dark chocolates, 2 bags of raspberry filled dark chocolate, 4 dark chocolate hearts, 2 oversized lollipops, and the piece de resistance, a tin filled with 36 Godiva chocolates and truffles. Original price on the Godiva tin was $65! (!) (heart attack). I love chocolate as much as the next girl, but really hoping no one paid that much for a Valentine’s Day present. But dark chocolate is the healthy kind, right? I was sorely tempted to buy the whole inventory to save for “presents” but I’m valiantly trying to reform my hoarding ways and, let’s be honest, none of that chocolate would have ever made it out of the house. Thanks to a tip from Melissa that Target’s Christmas items were 90% off on Friday (I posted it to Facebook here), I found a few bargains last week, including gift bags for $.10 and $.15, a Baby’s First Christmas ornament for $1, shiny silver tissue paper for $.20 and some rolls of ribbon for $.20-$.30. 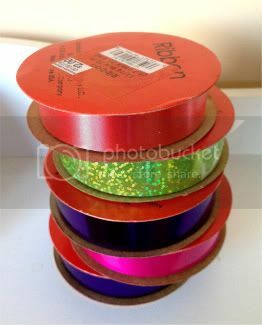 With any seasonal clearance, I try to look for items (like the tissue paper and ribbon) that can be used year-round. The ribbon is being put to good use already. 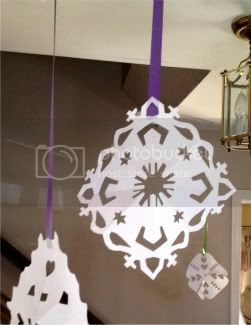 My son has requested a blizzard of paper snowflakes and we are hanging them from the ceiling with ribbon all over the house. He loves his winter decorations! The toy clearance was also underway at Target with several aisles marked 30-50% off. Have you found any stupendous clearance bargains lately? Target, grocery stores, clothing retailers are all marking down prices to get rid of inventory. If you stumble across any great clearance sales this month, please share!